Anybody who’s had the pleasure (and I use that word loosely) of listening to the stock speakers in most BMWs will know that it’s a pretty underwhelming experience. Owners of cars with the premium Bowers & Wilkins sound system (at a correspondingly premium price of around $4000) are in for a treat, but we mere mortals have to make do with speakers that would struggle to compete with a run-of-the-mill home hi-fi. BimmerTech made a name for itself amongst BMW audiophiles with its Premium Audio System, an amplifier kit based around the impressive 8-channel PP86DSP. Effortless installation thanks to the included bracket and harness, alongside a powerful 64-bit DSP with a 30-band graphic EQ made for a winning combination. Not content with rest on their laurels, the folks at BimmerTech have returned with their Alpha One Speaker kit, a full set of woofers, midranges and tweeters promised to sound great with or without the company’s amp. But do they live up to the hype? We took a look at the kit for the F30 3 Series with the HiFi sound system (option S676A). That means a pair of 2 ohm woofers, along with a total of five midranges and two tweeters to scatter along the length of the car. That’s the ‘Studio Sound’ kit, replacing every stock speaker, but you can also pick up ‘Driver’s Choice’ — a smaller set featuring only the speakers located in the front of the car, to the disappointment of any passengers you might have on the back seat — or just a pair of woofers, what BimmerTech calls ‘Pure Bass’. Compared to a lot of speakers on the market, they definitely look a lot of fun. Where you’d normally expect to find a black speaker cone with a discrete little dome in the center, BimmerTech has opted for a slightly reflective cone around an attention-grabbing machined aluminum dust cap. Purely cosmetic, I’m sure, in a slightly pointless way when you remember they’re going to be hidden behind the speaker grills when they’re installed, but it’s a nice surprise when you open the beautifully minimalist packaging. The proof of the speaker-pudding is in the eating-with-the-ears, though, so are these going to be able to satisfy our aural taste buds? 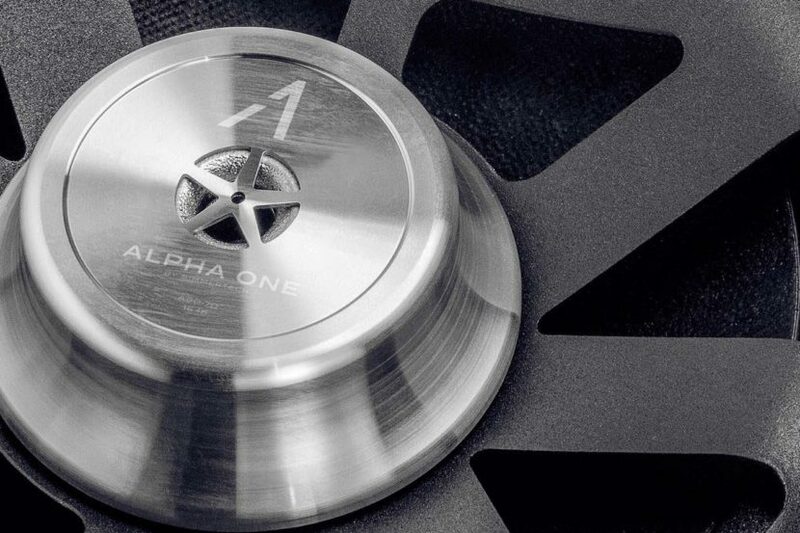 It won’t take long to find out; the Alpha One speakers pick up where the company’s amplifier left off, offering quick, easy installation. Every speaker is designed to perfectly match the mounts of the BMW stock speakers, and includes a simple socket for the audio input cable, so getting them in your car doesn’t require much in the way of DIY skills. With the speakers installed, we put them to the test with a few songs from our playlist: Boston’s “More Than a Feeling”, “Oblivion” by Grimes and the Carolina Chocolate Drops’ take on “Hit ‘Em Up Style”. What’s immediately clear isn’t so much the improved power, but the clarity and balance across the spectrum. The stock BMW speakers have a tendency to sound a bit muddy at times, and really start to break up as you increase the volume. BimmerTech’s speakers are much happier handling more power, and even in the enclosed space of a car, it feels like there’s more space for each instrument to shine. There’s nice separation between the twinkling guitar and the bass in the verses of “More Than a Feeling”, and when the chorus comes in, the distorted riff isn’t messy alongside the percussion, as it sometimes can be on smaller speakers. There’s a completeness to the sound that makes it very pleasant to listen to. The synthy bassline of “Oblivion” packs a reassuring punch, without overwhelming the airy vocals, which still have plenty of definition (comparatively speaking, of course; Grimes isn’t exactly renowned for her articulation). The tweeters handle the snare well, which cuts through the mix nicely. It’s sharp, but not irritating, as you’d hope. The fiddle in “Hit ‘Em Up Style” gives the tweeters a good workout, which they do well with. There’s a nice warmth to the high end, managing to capture the raspiness of the fiddle without it becoming piercing. The midranges aren’t too put off by the intricate banjo rhythm that could easily turn out muddy on the stock speakers, while the woofers give the kick drum plenty of drive underneath it all. Overall BimmerTech’s speakers do sound amazing. They are a definite improvement over the stock BMW speakers, particularly in vehicles with the lower-end stereo options. We didn’t have a chance to test them with an aftermarket amplifier, but we imagine they’d fare even better in that case, given how much more comfortable they are handling higher power levels. As they’re designed specifically for BMW — and BimmerTech seems to have plenty of speaker types listed on their website — installation is simple and everything looks perfectly stock. The only difference you’ll notice is the sound.